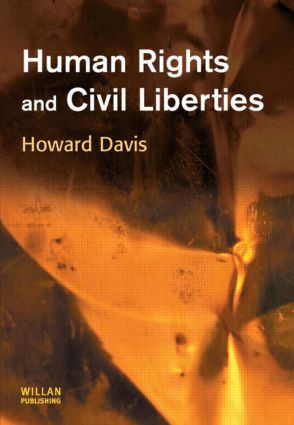 This book provides a wide-ranging and accessible textbook covering the main areas of civil liberties and human rights law as it applies to England and Wales, meeting the requirements of undergraduate law syllabuses. The book sets out not only the legal rules, common law and statutes which relate to the field of civil liberties and human rights, but also the arguments and debates which have surrounded the development of an increasingly controversial area of the law, looking at the background principles underlying it, the coherence and consistency of the rules one to another and the social and political consequences of their application in practice. Particular attention is paid to the impact of developments in Europe, and especially to the Human Rights Act 1998 which has had an especial impact on the freedom to participate in determining public goals and the ability to preserve an area of personal autonomy. The book also addresses the nature and impact of the major statutory reforms in areas such as surveillance, protection of personal data and freedom of information, and devotes as well a chapter to the increasingly prominent issue of 'terrorism' and how the government and the law should respond.